Villa del Monte Winery is pleased to announce that the 2011 Los Angeles International Wine and Spirits Competition has awarded a Silver medal to our 2009 Cabernet Sauvignon Santa Cruz Mountains Villa Festa Vineyard. Nearly 3200 wines from 16 countries were entered into this prestigious competition which was held from May 18 to 20 at Fairplex in Pomona, CA. 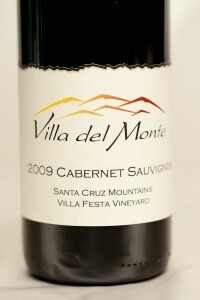 The 2009 Cabernet Sauvignon Santa Cruz Mountains Villa Festa Vineyard is truly a Santa Cruz Mountains wine, as it is produced from 100% Cabernet grapes grown on a small vineyard that we manage on Loma Prieta Avenue in the Santa Cruz Mountains. Black currants, medium tannins, and a beautiful deep red color combine for a full bodied wine that develops and matures on the palate. With 14% alcohol, this wine is delicious now or it can be cellared for later enjoyment. It is available at the winery, on the web site, at Summit Store in Los Gatos, and at Birk’s Restaurant in Santa Clara. Now in its 72nd year, the 2011 Los Angeles International Wine and Spirits Competition is one of the world’s largest and most prestigious international wine competitions. Nearly 3200 wines from 16 countries were entered into the competition. Judged by a 64-member panel of international judges over three days, wines were tasted blind with no knowledge of producer or price. For more information, visit http://www.fairplex.com/wos/wine_competition/index.asp. Results are posted at http://www.fairplex.com/wos/wine_competition/AwardsCelebration/documents/WineResultBookByCompany.pdf.